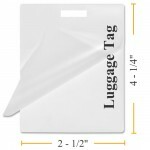 Luggage Tag Pouch Measures 2 1/2" x 4 1/4" (64mm x 108mm). Laminating Film available in 5 Mil 7 Mil or 10 Mil Clear Gloss Standard Pouches, Colors, and Matte Film options. They have 1/8" Rounded Corners. The Slot is on the short side of the laminating pouch so the luggage tag hangs portrait format. Get Free Carriers in every box. If you are looking for discount laminating pouches, see our bulk buys.